With Nearly three and a half decades of scaring Central Illinois. The Marquette Heights Men's Club presents three horrifing events for one admission price. 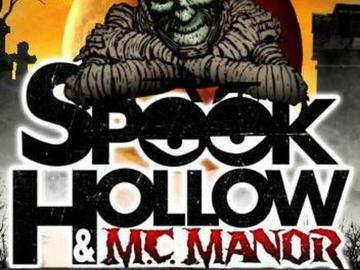 Spook Hollow, the one that started it all and the longest running outdoor haunt in Illinois and M.C. Manor, a spine tingling haunted mansion with movie quaility set designs promises to provide you the scare factor you crave. As if that is'nt enough, 2013 will be the BEST year ever with a THIRD haunt added. The all new M.C. NIGHTMARE will lead you through a twisted and run down industrial haunt that will claim you as another lost soul deep within it's rusty walls. Three haunts combine to bring you the TRILOGY OF TERROR! You should not participate if you are under 10, are pregnant, have claustrophobia, heart or respiratory problems. You will not be admitted if you appear intoxicated or are wearing any form of temporary cast, medical brace or crutches. No photography or videography is allowed. No cell phone use while in the haunt or on the trail, No Smoking, No lighters, No drinking or eating, No masks, No flashlights, No profanity, No touching of actors, No alcohol allowed on the premises, No pets (service animals allowed). This ticket is a revocable license and may be taken and admission refused for not following our rules.